Villa Hespera is a wonderful 3 bedroom villa offering superb views, located just outside the resort of Trapezaki. From your private infinity pool, the picturesque hillside frames the sea with views to the neighbouring island of Zante. You'll have plenty of outdoor space with a large pool terrace, so you'll be able to make the most of the long sunny days. The villa is in a great position, with a couple of tavernas within a few minutes' walk and Trapezaki Beach only 5 minutes' away by car. Pool heating, WiFi and air conditioning/heating in all the bedrooms are included. The spectacular countryside and sea views, combined with lots of outdoor space, make Villa Hespera a fabulous choice! The private infinity pool offers wonderful views of the surrounding scenery, and there is plenty of space to relax on the sun loungers dotted around the pool terrace. 4 steps up lead to a raised covered terrace with comfortable seating and an outdoor dining area, great for enjoying those alfresco meals overlooking the sea. This terrace continues round the side of the villa, where you'll find a brick BBQ. The villa is accessed off a village road via a driveway shared with Villa Eos next door. There is off-road parking for your hire car. The open plan lounge, dining and kitchen area is kept bright and airy by patio doors leading out to the covered terrace and pool area below . The large patio doors frame the wonderful countryside and sea views. The space is pleasantly furnished with ample seating, a dining table and chairs, and a TV. The traditional kitchen has wooden cabinets and is fully equipped for your holiday meals. On the ground floor is a bright twin bedroom with en suite shower room and patio doors opening on to the raised covered terrace - great for waking up and jumping straight in the pool! There is also a separate WC on this level. Upstairs is a second twin bedroom with en suite shower room and 1 double bedroom with en suite bathroom. These rooms each have their own private balcony overlooking the swimming pool, with fabulous sea views. This villa is registered and licenced by EOT Greek licensing association. This number is: 0830K10000837601. Set off the main road to Trapezaki, Villa Hespera is a detached property overlooking the olive groves and sea in the distance. There is a local taverna just across the road, and a mini market is within 10 minutes' walk. Trapezaki resort centre is less than 5 minutes' drive away, with bars, shops and restaurants as well as the sandy Trapezaki Beach. Our villa Eos is next door. There is a local mini market just 10 minutes' walk from your villa, perfect for stocking up on holiday essentials. The centre of Trapezaki has a couple of small shops, so you can pick up a few holiday souvenirs. The nearest supermarket is located on the main road to Argostoli, a short drive away. There is a local restaurant just across the road from your villa, with wonderful views of the surrounding countryside. Trapezaki has a good selection of tavernas in the centre, with a relaxed atmosphere, great for enjoying a glass of wine overlooking the sea. The next village of Lourdas, less than 10 minutes' drive away, also has a couple of good tavernas serving local Greek cuisine. Trapezaki Beach is less than 5 minutes' drive from your villa and has sunbeds and umbrellas available to rent in the high season, and a taverna serving lunches. The sand shelves slightly, making this a great choice for families. If you're feeling active you can walk along the coast to the next resort of Lourdas, which has a long, white sand and pebble beach, known as one of the most beautiful beaches in Kefalonia. The Kefalonian coastline is beautiful, with many small coves and beaches just waiting to be explored. Why not hire a boat, take a picnic and make a family day out? The north of the island is a complete contrast to the south, with the harbour of Fiskardo well worth a visit. You can also take a trip to Assos Castle and the sweeping bay of Myrtos. En route stop at Karavomilos to admire the pleasant surroundings and the lake. Trapezaki is a pleasant and uncrowded resort, spread out amidst the olive groves and countryside. There are some fabulous walking routes nearby. Villa Hespera is not available to book for season as it is sold out. 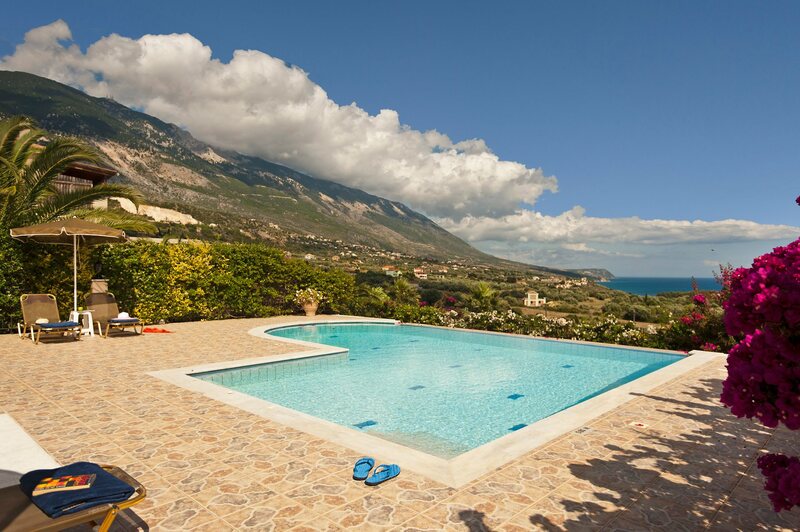 Take a look here at the Kefalonia villas that are currently on sale. Booked to go back to Villa Hespera in May. Wonderful holiday, great service all round. Wonderful Villa, would definitely consider going again.